Recently, I was having coffee with a number of my Real Estate peers and the subject of the Saint Joseph Statue was brought up. I had known about the Statue for some time and have even used it on hard to sell properties. My parents’ agent used the statue years ago to sell their house. For those of you unfamiliar with Saint Joseph, he was Jesus of Nazareth’s earthly father. He was a skilled carpenter and taught his skills to Jesus. He made sure his family always had a home over their head. 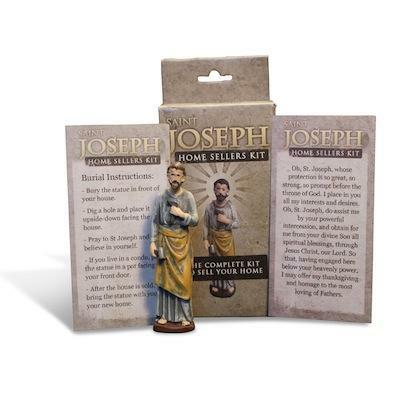 For centuries, people have prayed to St. Joseph when they needed help in finding or selling a home. Legend has it a group of Nuns in the early 1500’s needed land for their cloister. They prayed to St. Joseph and then buried St. Joseph medals and continued to pray to him. Shortly, after their prayers were answered and they received the much needed land. Their medals were the first “St. Joseph Real Estate Sales Kit”. Later the medals were replaced with small statues. Whether you are a believer or not, the Legend is well known in Real Estate circles. The “Real Estate Sales Kits” are available at many Real Estate Board stores. Thousands of testimonials are available on online websites that sell the “St. Joseph Sales Kits”. The statue is buried head down in front of the property. A daily prayer is recited asking St. Joseph to help. When the house sells, the owner is to dig up the statue and take it to their new home. The statue is then buried head up and the blessings follow the family to their new home. So, if you have a hard to sell property, you may want to look into this historic sales kit. Will it help? I can’t say but a little prayer never hurts!